Do you struggle with mixed groups? We all know it can be challenging sometimes to find easy activities that incorporate many different goals in order to meet each student’s individual needs. 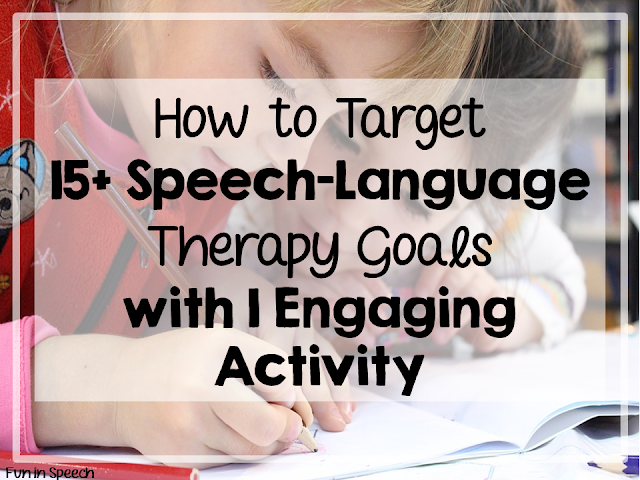 That’s why I want to show you a fun and simple activity that can target 15+ different speech-language therapy goals! 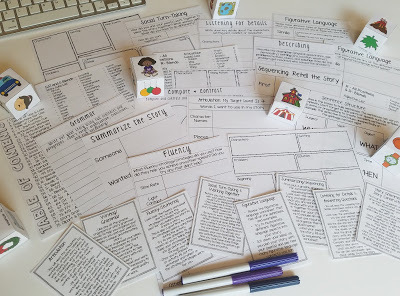 Story cubes & articulation cubes are the way to go for mixed groups! You can target SO MANY different goals! 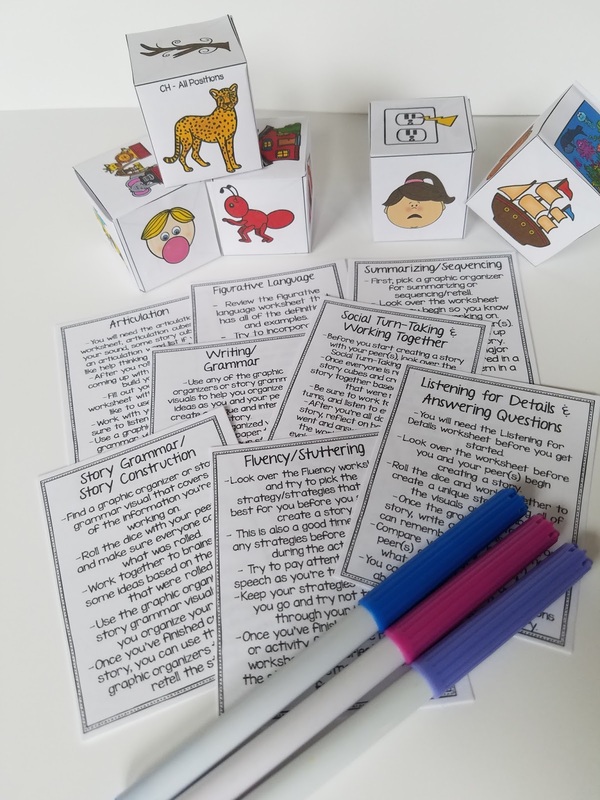 I have put together some great printable resources to make targeting different goals with these activity cubes even easier. 🙂 Check out some of the suggestions below to see how EASY targeting multiple goals can be! 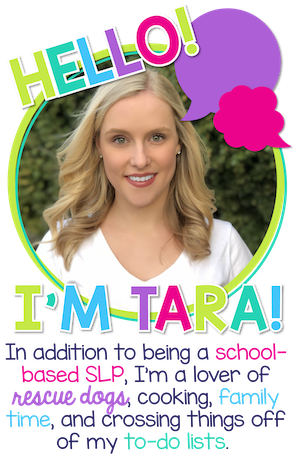 There are multiple resources included to help you target articulation at many different levels. First, there are Articulation Word Lists for each of the above mentioned sounds. 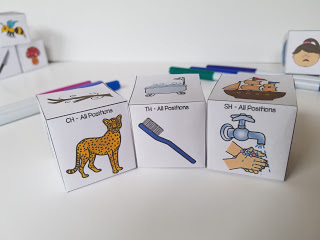 These word lists provide you with target words that can be found on the story and articulation cubes. In addition to these word suggestions, there are articulation word lists for adjectives, verbs, and adverbs. 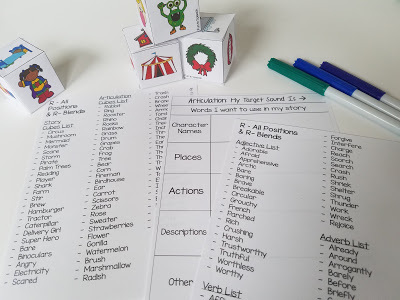 These are great to help your students utilize rich vocabulary in their stories while loading them with their target sound. Your students can use the Articulation Worksheet included to organize all of the words they would like to use in their story. Articulation cubes for each sound mentioned above have also been included! 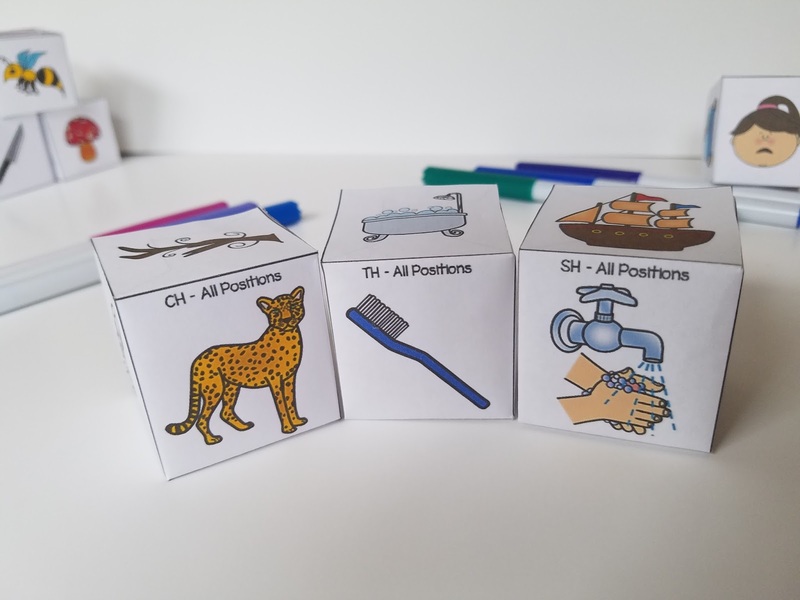 There are 3 articulation cubes for each sound/set of sounds (e.g., 1 cube for Prevocalic R, 1 cube for Vocalic R, 1 cube for R- Blends, 1 cube for S- Blends, 2 cubes for S/Z, 3 cubes for CH, 3 cubes for F/V etc.). This helps LOAD the stories with target sounds. 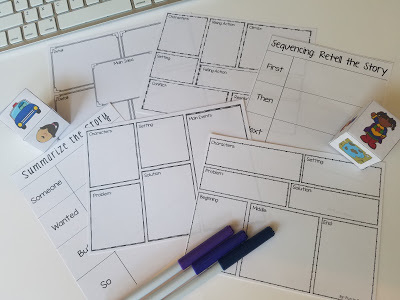 There are 2 worksheets included for summarizing and sequencing, however, you can target these skills in multiple ways using the various story maps. 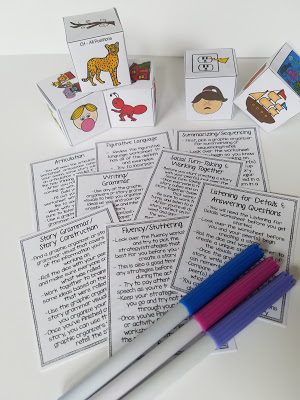 The visuals themselves on the story cubes also act as a great prompt to aid in summarizing and sequencing. 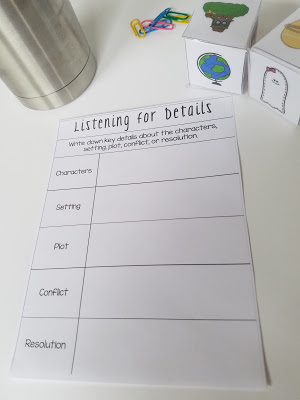 The students can use this worksheet to help them jot down details while listening to a story or they can fill it out after listening to a story, while trying to remember as many details as possible. This worksheet can help your students create rich descriptions of story characters, events, conflicts, etc. while organizing their thoughts on a visual. The Articulation Word Lists also come in handy here to help the students form detailed descriptions with a variety of words. 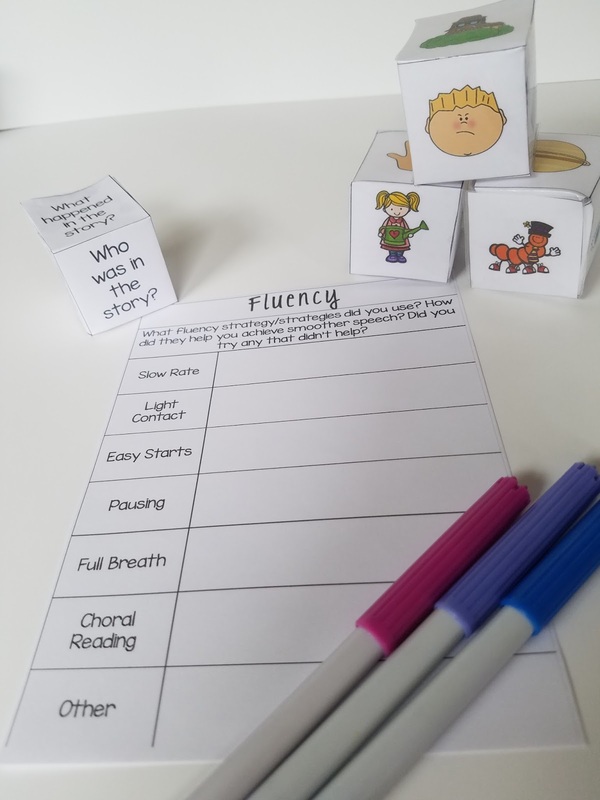 This worksheet is great to go over before beginning the activity so the student can review various fluency strategies and practice before he/she starts the activity. The student can then use the worksheet to reflect on how the strategies either did or did not help. This worksheet is an excellent self-assessment tool for students. 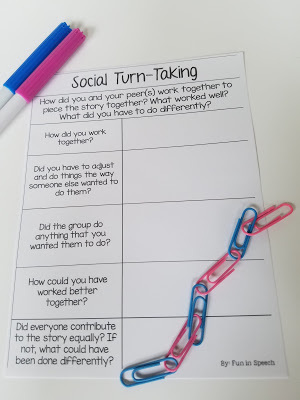 The questions are geared towards reflecting on the individual student, the overall group dynamic and cooperation throughout the group/activity. Grammar can easily be targeted throughout the entire activity as students begin putting their ideas together. 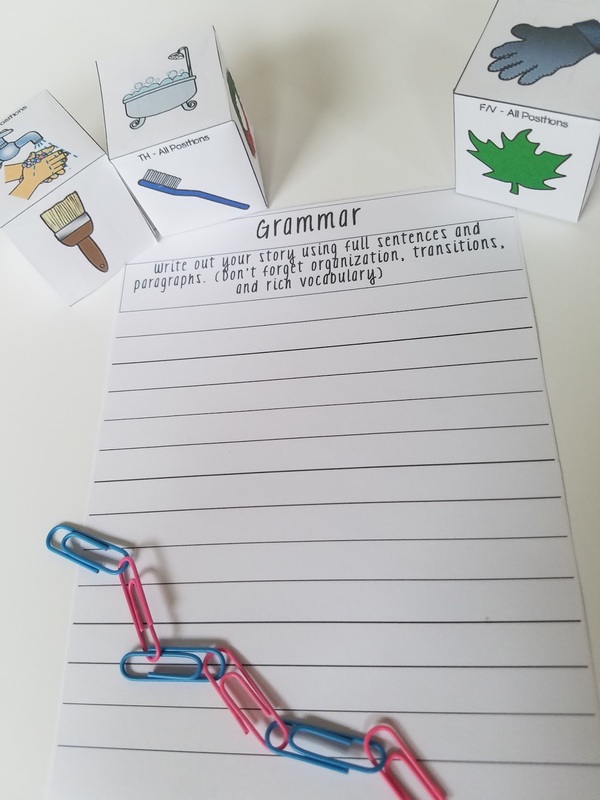 The Grammar Worksheet is included for students who wish to write their story. This can help you and the student assess and correct his/her written work. The sentence structure visual helps create an interactive component to the activity, using the visual and the story/articulation cubes. 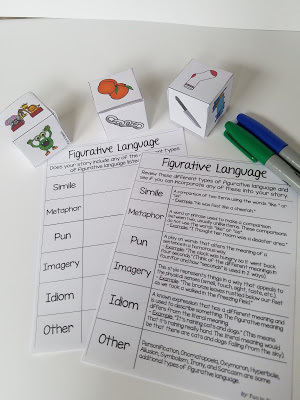 A Subject-Verb-Object & Subject-Verb-Object-Manner-Place-Time visual has been included, in which the student can place different story/articulation cubes on the space for each sentence component. 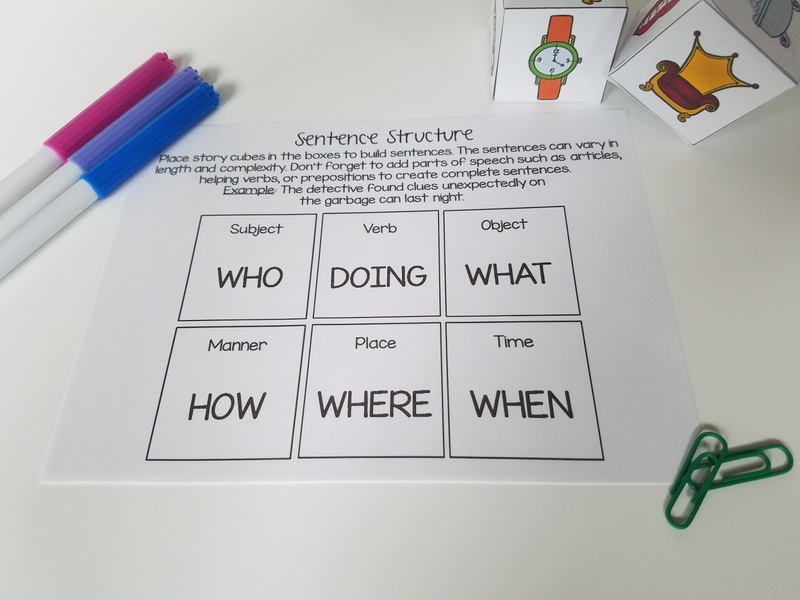 Not all spaces have to be used, you can customize this section to target the particular sentence structure that you wish. 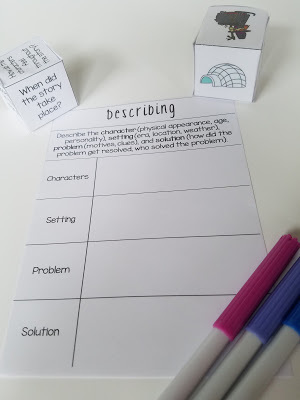 There are a variety of graphic organizers and visuals included so your student can choose one that targets exactly what he/she is working on. Each student can fill out a visual as they begin organizing their ideas or as they tell their story. These visuals can be used in many different ways to target a multitude of different goals. There are 10 story grammar cubes and 24 articulation cubes for the sounds previously mentioned. 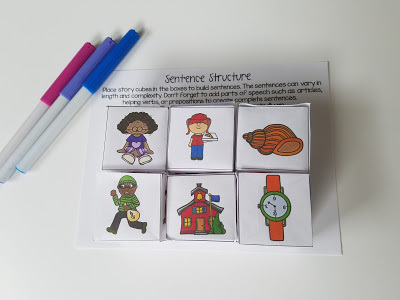 These activity cubes are loaded with visuals that promote excellent story telling (e.g., characters, settings, problems, etc.). You can use anywhere from 3-10 cubes in order to create a story. I typically have my students use 6 story/articulation cubes. The number will vary based on ability levels and goals. *There are more visuals and materials than what have been pictured here. 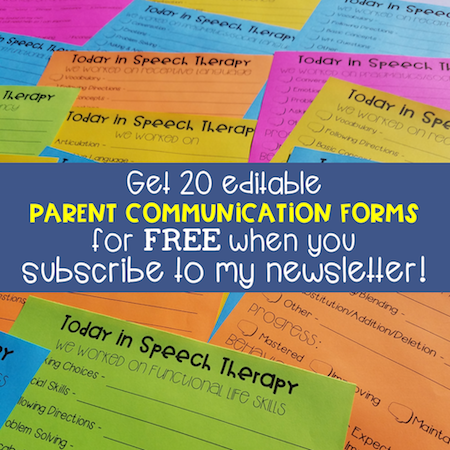 – Table of Contents: This allows you to quickly access and print exactly what you need. 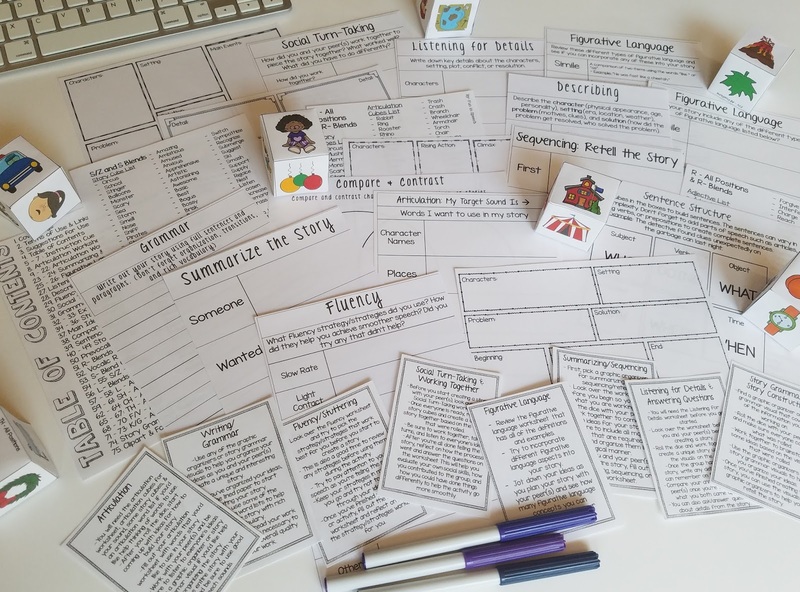 – Instructional Cue Cards: These are great visuals to help the students understand what is expected of them and help them participate throughout the activity. 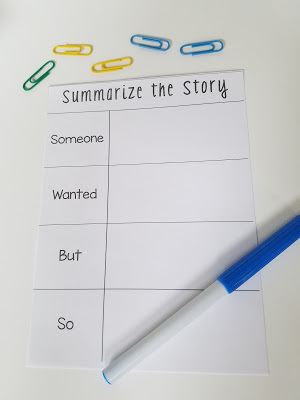 I suggest giving each student an instructional cue card for the goal they will be targeting and reviewing each quickly before the activity begins. 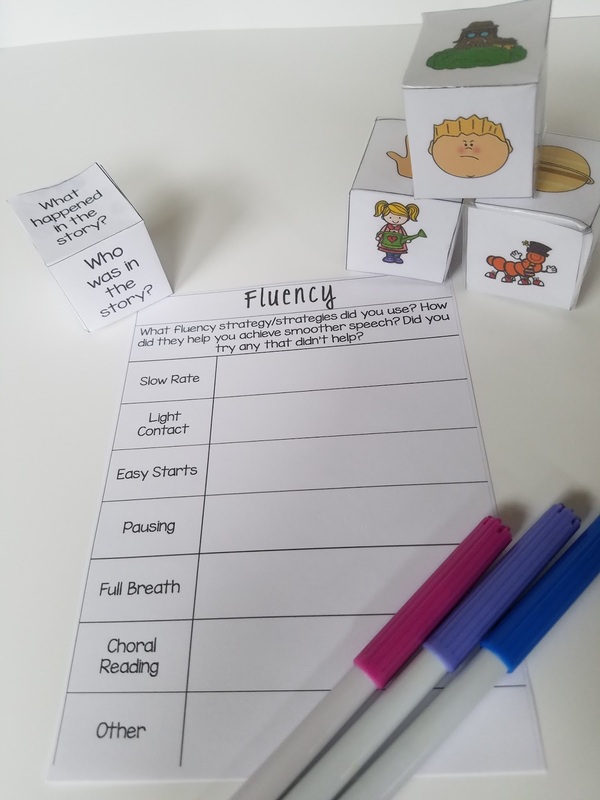 – Blank Instructional Cue Cards: There are 3 blank instruction cards so you can incorporate any other goals you see fit and have the instructions on hand, ready to print each time. – Perfect Size for Printing 2 Per Page: I typically print all of these materials 2 per page. All of the text and visuals are still easily legible. There is also enough room for students to fill in each section of the worksheets when printed this way. – Once the Activity Cubes are Constructed, the Rest is Print & Go: This is especially useful for days when you need therapy ideas on the fly. 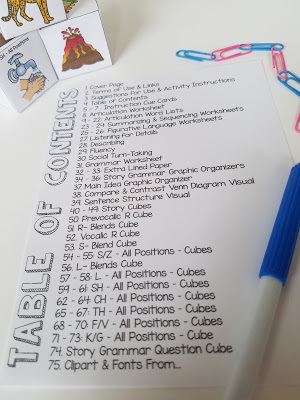 You only need to construct the activity cubes once (I’ve used card stock and I’ve also laminated them before, both worked great). Once you have your activity cubes, you can conveniently print exactly what you need each time using the table of contents! Each activity visual is also black & white/low ink. – Ability to be Used with Other Story Cubes: There are currently other story cubes out there on the market that you can use with these resources. No other story cube activities (that I have found) target articulation and all of these other goals though. 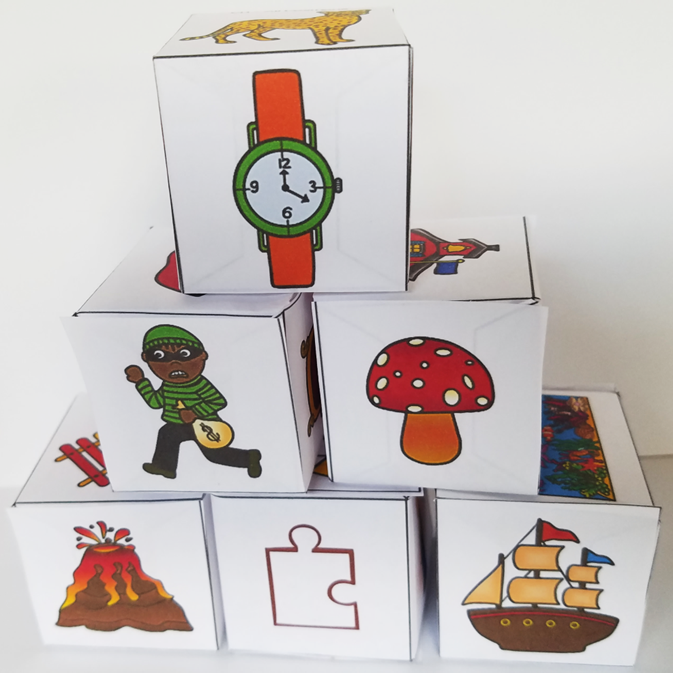 These cubes can, however, be used in conjunction with the materials provided to help target a variety of speech-language goals. – Flexibility to Target Even More Goals: Due to the variability in materials and activity cubes, you have the ability to structure the activity in any way that you’d like. In addition to the goals mentioned above, you can target WH- questions, specific social language concepts, yes/no questions, verbs, S-V agreement, critical thinking, problem solving, etc. The possibilities are endless! 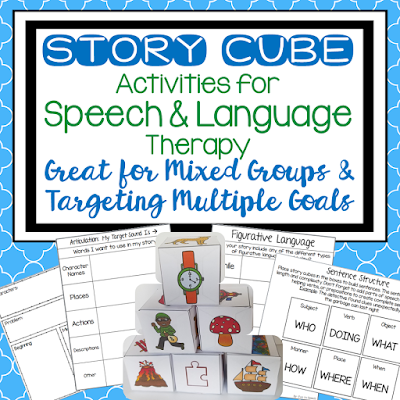 You can check out these Story Cube Activities for Speech-Language Therapy by clicking the visual below. Think of all the possibilities and goals that you can target with just this one, simple activity!